Many organisations appear to take the view that working together should be easy, and do ‘something’ without realising the complexity that is inherent in working in the space of human relationships. This is despite the common evidence of lack of internal collaboration – evidenced through silos, hubris by managers, poor internal communication, bullying, lack of engagement, blocking, process failures across white spaces, etc. Unfortunately, leaders and managers are often unaware that there is an incubation period between the circumstances leading to the risk outcomes, and the actual occurrence of the risk event. This can lead to failure to understand the actual cause of the risk event that the organisation is now experiencing. 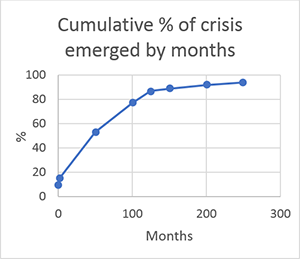 Fitzsimmons and Atkins discuss incubation times from root cause to the emergence of failure and crisis. Their research, together with that of Turner indicates considerably longer incubation periods than generally thought. This is important because when time separates cause from effects, feedback is likely to be poor and distorted by bias. The organisation is unlikely to learn from the problems in the collaborative experience, and will simply repeat the same mistakes. Long incubation periods can also lead to complacency as organisations and their leaders feel successful, and even talented, for long periods. The truth is that deep seated systemic and relationship issues have not yet materialised. Fitzsimmons, A and Atkins, D (2017). Rethinking Reputational Risk. Kogan Page Limited.